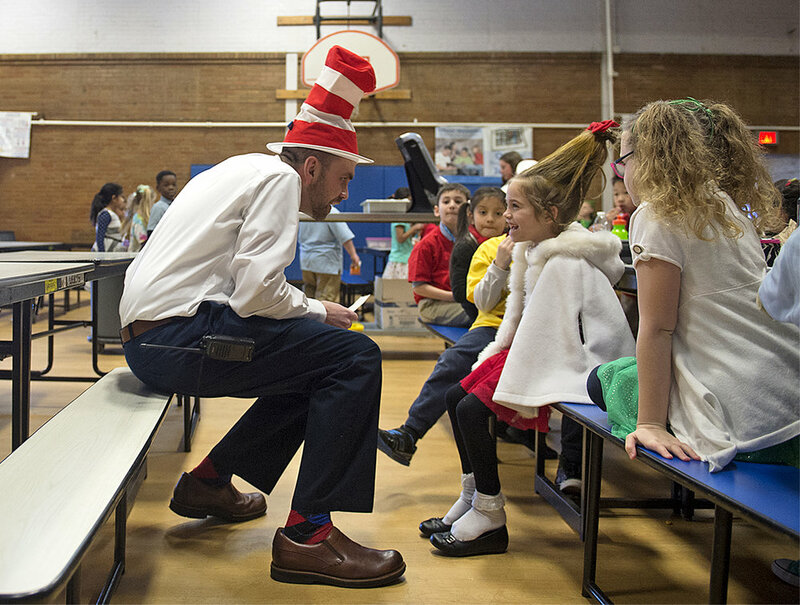 School Lane Charter School Vice Principal Jim Munizza, dressed as The Cat in the Hat, talks to first grader Kiersten, 6, in costume as Cindy Lou Who, before reading Oh, the Places You'll Go! to her class while celebrating Dr. Seuss' birthday at School Lane Charter School in Bensalem on Thursday, March 2, 2017. Cobalt Ridge neightborhood friends (from left) Vincent Ireland, 10, Tyreek Ross, 10, and Thomas Vlassenko, 10, hold their noses as smoke pours over them while firemen work on a fire in a home on Canoe Birch Road in the Cobalt Ridge section of Levittown in Middletown Township on Tuesday, October 4, 2016. Sister Maureen Patricia Ryan laughs at an old photo of herself while surrounded by her nephews from Ireland (from left) Noel Roberts, Kevin Roberts and Ted Roberts, all sons of Ryan's sister, during a centenarian birthday celebration for her at the Motherhouse of Sisters of the Blessed Sacrament in Bensalem on Thursday, January 12, 2017. Parishioners from St. Thomas Aquinas Church in Croydon walk with fellow parishioner Tony Cinkutis, 75, as he carries a cardboard cutout of Pope Francis to the train station across the street from their church on Sunday, June 28, 2015. The Croydon train station was a stop on the Trenton line for the World Meeting of Families in September. 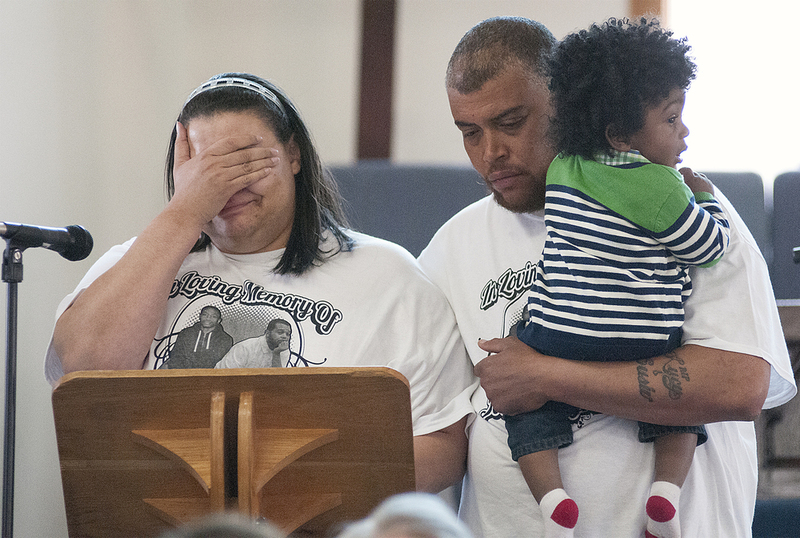 Te-Shawn Wilson, sister of July 2014 triple-shooting victim Tyrone Moss, is overcome with emotion while standing with Vincent Moss and little cousin Josiah McClain, 1, while trying to speak to the group gathered at the House of Prayer Church in Bristol Township about gun violence on Sunday, April 19, 2015. Community marched from Norton Avenue Baptist Church to the House of Prayer Church to pray and walk to honor the memories of those who have lost loved ones to gun violence. A small service was held at the House of Prayer for speakers to talk about loved ones who have become victims of gun violence. 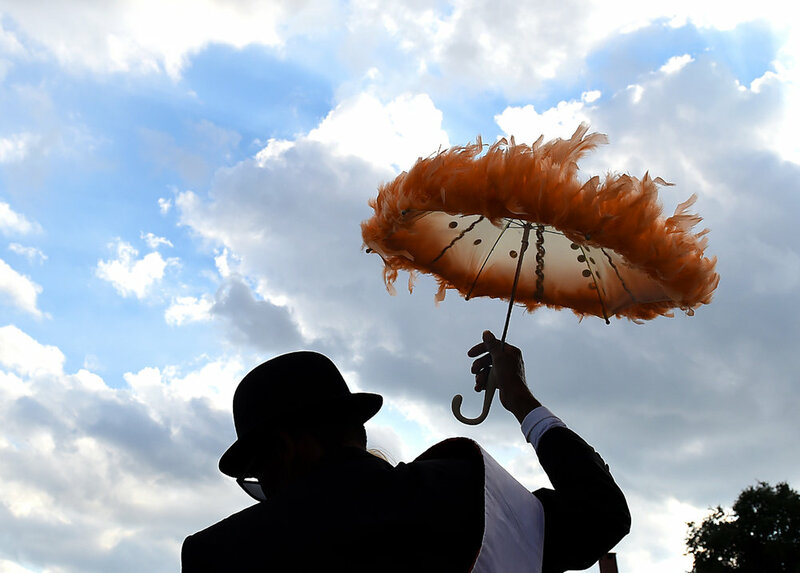 Oswald Jones, or 'Bo Monkey,' leads the Treme Brass Band as grand marshal during a second line for the 10th anniversary of Hurricane Katrina on Saturday, August 29, 2015. 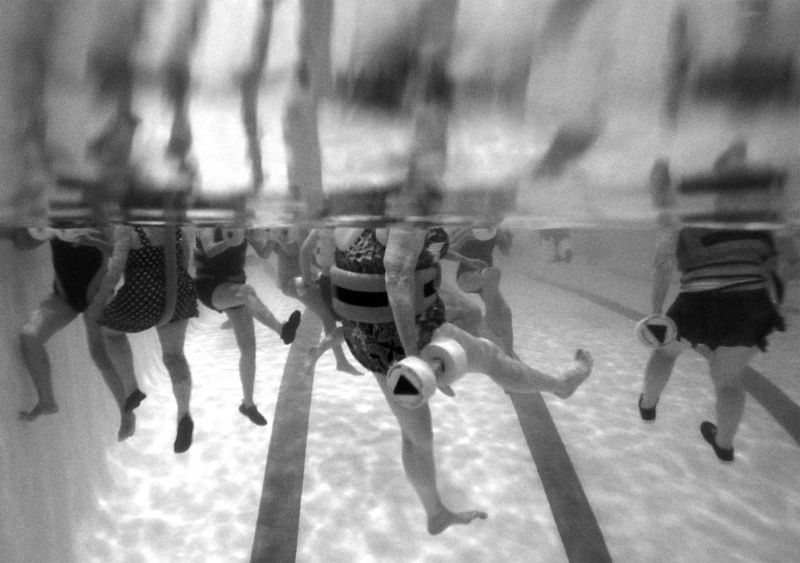 YMCA members take Donna Kramer of Langhorne's 11:45-12:30 water arthritis aquatics class at the Fairless Hills branch of the Lower Bucks Family YMCA on Monday, July 21, 2014. "I call the water 'The Fountain of Youth,'" said Kramer, a former Neshaminy teacher who teaches eight classes per week for the Y.
Ivan Enriquez, a Sacramento, California Bernie Sanders delegate for the 2016 Democratic National Convention, sheds tears during a sit-in at Tent 2 in the press village moments after Hillary Clinton secured enough votes to deem her the Democratic presidential nominee at the Wells Fargo Center onTuesday, July 26, 2016. Len Cassidy III, 11, a 5th grader at Lower Southampton Elementary School, is overcome with emotion while hugging dad, Staff Sergeant Len Cassidy, 35, during a surprise homecoming on Monday, May 18, 2015, in which Principal Michelle Burkholder organized a routine fire drill for Sgt. Cassidy, who has been deployed for over a year, to arrive via firetruck. Newtown Friends School pre-kindergarteners and first graders fidget during the presentation before the groundbreaking for for their new construction project on at the school on June 9, 2014. David Sheppard, 9, a third grader at Trevose Day School, home of Neshaminy Montessori, reads aloud his thank-you letter to local veterans during a program at the school in Lower Southampton on Tuesday, Nov. 10, 2015 ahead of Veterans Day, Nov. 11. Sheppard's letter ended with "You inspire me!!" A woman crosses West State Street in Doylestown during the morning snowfall on Thursday, February 9, 2017. Many area schools and businesses were closed because of the snowfall, leaving the street wide open to pedestrians. Faye Matter, 70, of Cheltenham, kisses her ball before her throw while participating in her first year of the bowling competition in the 70-74 age bracket during the opening day of the Bucks County Senior Games at Brunswick Zone XL in Lower Southampton on Monday, June 1, 2015. Falls Township Police Lieutenant Nelson Whitney kisses daughter Abigail, 12, with a gentle hand on son Ethan, 6, just two of his five children, before a county-wide blue mass at St. Andrew Catholic Church in Newtown Township on Monday, May 16, 2016. 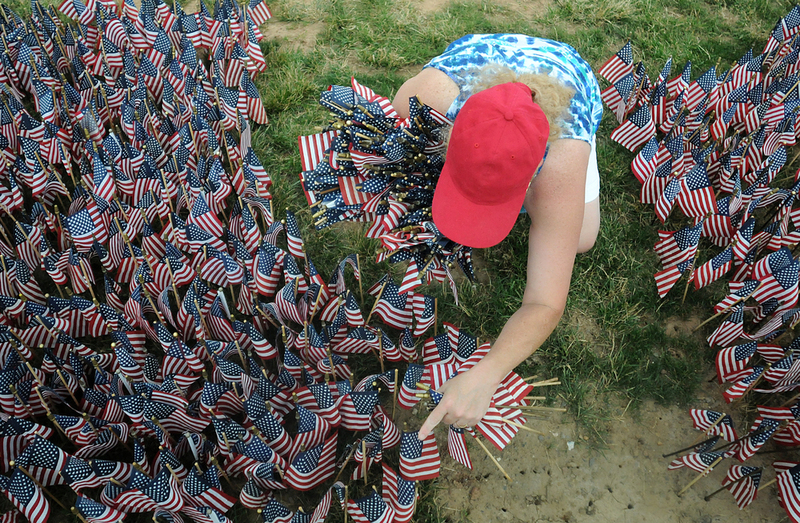 Donna Donohue, a friend of Treasurer Jesse Hill, unplants and collects flags following the Delaware Valley Vietnam Veterans 30th annual Donald W. Jones Flag Memorial for Flag Day at Falls Township Community Park on Sunday, June 14, 2015. 65,000 flags are placed in the ground for the memorial, which represents each American killed or Missing In Action during the Vietnam War. 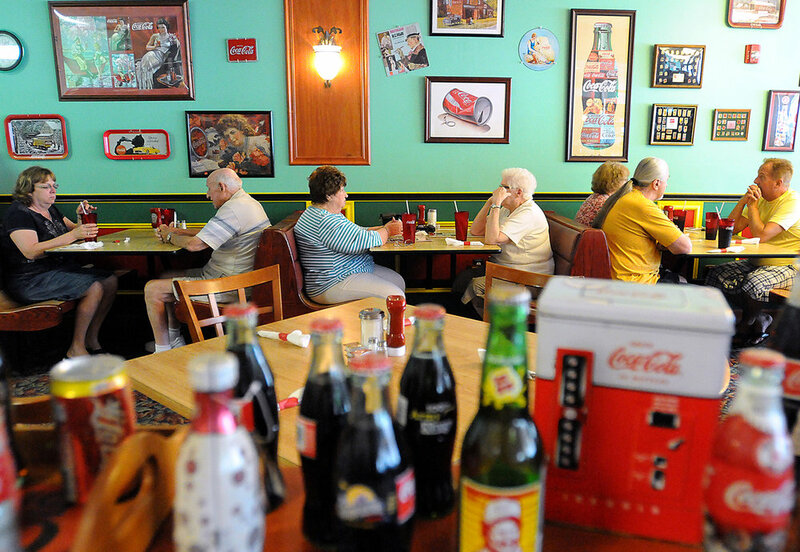 Customers eat at the Coca-Cola-themed Maryanne's Homestyle Cooking, which has reopened in Middletown Township after a fire last year at its location in Croydon. The restaurant has been in business for 27 years. Camper Mia Feeley, 9, of Fairless Hills, watches wide-eyed as Bill the resident Dexter Steer trained as an ox relieves himself in the field as kids learn about life and animals during the Colonial era during camp at Pennsbury Manor on Tuesday, July 14, 2015. Christopher Frank, 8, of Northampton, middle, rides the "Super Shot" tower at the Lower Southampton Athletic Association annual carnival on Sunday, April 26, 2014. Council Rock North graduate Nicholas Reich makes his way to his seat after he received his diploma during the graduation for the Class of 2015 at Walt Snyder Stadium on Wednesday, June 17, 2015. Gary Martin and his horse Snookie of Doylestown Township trot over the Neshaminy Creek via the Schofield Ford Covered Bridge in Tyler State Park on a fall evening in 2013 at sunset. The casket of 5-yr-old Franky Talley is escorted from the Hooper Funeral Home on W. Trenton Avenue in Morrisville by pallbearers dressed as superheroes to a mass at St. John the Evangelist in Morrisville before a burial at the Holy Trinity Cemetery in Lower Makefield on Monday, June 30, 2014. Franky lost his battle to a rare brain cancer the week prior.